A good crew is as important as your boat and sails. In this installment of our Ultimate Racing Playbook series, we look at managing your team. A good crew is crucial for the success of your program and plays a large part in having fun on and off your boat. Quantum’s Jason Currie outlines his recommendations for managing your team. Look like a team - Uniforms can go a long way to building a team mentality. Melges 32 team STIG is known for their awesome team style. Photo by Mauro Melandri. The considerable effort it takes to put a racing crew together and manage it is often underestimated. But it is one of the most important components to building a successful sailing team that also has fun together. A fundamental goal to managing your crew is to have a consistent team that can commit to most of the regattas on your schedule. Consistency creates continuity, which, over time, will lead to results on the water. In this day and age, however, building a regular crew can be a challenge. People have family commitments, especially weekends filled with children’s sports and other activities. If you need to fill a few roles, click here for quick tips on how to find good crew. If you manage your program well and take care of your team, your crew will continue to be available and you will continue to improve. First things first, the schedule. Start by looking at all the races and regattas you’re interested in sailing. Put them on the calendar and then step back and think about what is realistic. It’s easy to get excited about all of the great sailing events of the season, especially if you’re working on your plan in a snowy locale while waiting for spring to arrive. It’s easy to over commit. But remember that even though they’re a lot of fun, races and regattas are also a lot of work. Start small. Pencil in the local evening races and one major weekend regatta for the spring, summer, and fall seasons. It’s a lot easier and cheaper to add a last minute regatta if your team is up for it than it is to burn out your team and cancel a paid registration. Don’t forget to schedule in practices, particularly early in the season to brush off the dust. Remember new crew will need a chance to get warmed up to the boat. New systems or sails are other reasons to schedule an extra practice or two in order to update deck markers, make adjustments to roles, and fine-tune trim. Once you have a schedule your crew is comfortable with, the next step is to designate a communicator who will keep everyone in the loop. Designate one person on the team as the communicator. This doesn’t have to be the owner; quite often is the tactician on the team. Communication should start with everyone receiving a copy of the season schedule so that gaps that might need to be filled can be identified. Your team should also agree on a preferred communication method for the group. Whether it is group texts, chat, or email, there needs to be an easy way to communicate if something comes up or there is important information to relay. Be careful not to abuse this channel with unnecessary communication. Sharing this information will help individuals get their head in the game and take a level of stress out of travel logistics. Nothing says sharp like a team dressed alike on the race course. It makes the team look like they are on the race course for a purpose. Invest in some great looking, comfortable gear. And for individuals who take so much time away from home and family life, receiving crew gear is welcome and very much appreciated. Upon arrival at the regatta, work hard as a group to manage time efficiently on and off the water. Some teams may only have one or two practice days, so have a solid plan in place for what you want to achieve and make sure all the boxes are checked leading up to the first race day. An efficient and well-oiled team will designate the same person to do the same job every day, including simple things such as turning on the engine, docking the boat, covering lunches and water, hoisting the main, and feeding the main into the mast at the hoist. If the same person performs the same task, efficiency naturally comes and mistakes won’t be made prior to arriving on the race course. A great example of team efficiency and the importance of individual roles is water management. Sounds crazy, but it’s not. Too often we return to the dock after a day of racing with a dozen bottles of water still onboard. The top teams don’t because they don’t want to carry the extra weight. Designate a person to track water usage. Record how many bottles are onboard at the start of the day, and then how many are left at the end. By doing this, the person will be able to fine-tune the exact amount needed while also keeping the boat as light as possible. At the end of each race day, make a goal to get out of the sun as soon as possible, especially if it’s the middle of summer. Work hard as a group to pack up the boat correctly. Again, individual roles come into play. One person is cleaning the interior and removing any water in the bilge while another fold sails and packs spinnakers. Work efficiently as a group to put the boat to bed for the night so that everything is good to go for the next day’s race. Most teams do crew dinners during a regatta. While restaurants can get a little old, especially if there is a wait time, consider hosting a BBQ if the regatta is in your home town. This is a sure way to bond as a team and a great way to include spouses. Click here for other tips for keeping your crew happy and loyal. 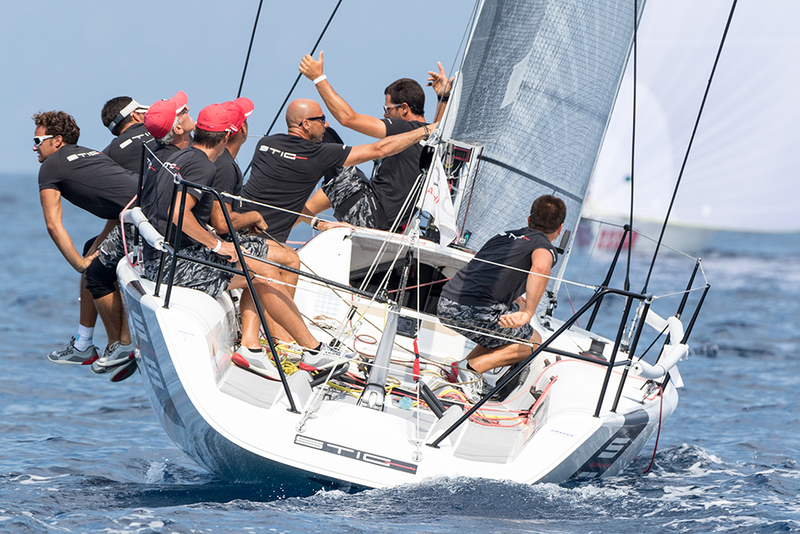 Following the conclusion of each regatta you sail, have the tactician write a debrief that goes to the entire team. It should include all aspects of the event, from the practice days to the last race. The debrief should include areas of the regatta in which the team performed well as well as areas that require attention. By doing this, the team will be ready to work hard on specific things on the first practice day at the next event. Taking care to properly manage your team and keep them happy will make all the difference. Not only will everyone have more fun, but they will be more loyal and your team will be more successful.